Healthcare providers strive to prevent venous thromboembolism (VTE), manifested as either deep vein thrombosis (DVT) or pulmonary embolism (PE). Symptomatic PE has a 10% mortality rate within the first hour of onset of symptoms, and DVT alone can lead to a post-thrombotic syndrome that severely limits patients' quality-of-life (Caprini, 2010; Nayak and Vedantham, 2012). Due to various complications of the condition, VTE is considered the leading preventable cause of in-hospital deaths, affecting nearly 900,000 individuals and leading to 300,000 deaths in the United States annually (Raskob et al., 2010). In addition to the immense impact of VTE on morbidity and mortality, the condition represents a significant economic burden, costing the US healthcare system more than $1.5 billion per year (Dobesh, 2009). Risk of VTE is an especially significant concern for patients undergoing orthopedic surgery for traumatic injuries. The incidence of DVT in orthopedic trauma patients was cited in 2015 as being as high as 80% without prophylaxis (Scolaro et al., 2015). However, many orthopedic trauma patients who present with known risk factors still do not receive the prophylaxis they need, even though antithrombotic prophylaxis has been shown to reduce patient morbidity and mortality following major orthopedic surgery (Falck-Ytter et al., 2012). VTE risk factor assessment scores, such as the Wells score and Geneva score, are frequently used to risk-stratify patients for VTE in order to guide prophylactic decision-making. While this method of assessment has been shown to effective in predicting thromboembolic risk in general, a classification system for orthopedic trauma patients in particular has yet to be developed (Klok et al., 2008). Moreover, it is unclear which diagnostic tests and therapies are best suited to managing VTE in orthopedic trauma patients. Due to the high incidence of VTE and the morbidities associated with the condition, it is critical for clinicians to understand modern methods for VTE management. Moreover, by highlighting the risk factors, diagnostic methods and VTE prophylactic measures that have been investigated in the literature, it will be possible to identify the most effective VTE management strategies and create VTE management guidelines specific to orthopedic trauma in the future. Ultimately, centralizing methods and recommendations for VTE management will enable clinicians to reduce the morbidity and mortality caused by VTE in the setting of orthopedic trauma surgery. The goal of this review is to summarize information from the literature in order to better inform clinicians about how to detect and prevent VTE in orthopedic trauma. To identify articles, we hand-searched leading journals, as well as online databases including the Cochrane Library, PubMed, and Scopus. Additional articles were found by reviewing the reference lists of already included articles. We evaluated articles based on their scientiﬁc merit (peer review, study methodology, and number of citations) and applicability to clinical orthopedics. Surgery and trauma can cause endothelial damage, initiating the coagulation pathway by releasing pro-coagulant components such as tissue factor from endothelial cells (Dahl et al., 2015). Hypercoagulability also results from the release of cell signaling molecules called cytokines after initial injury. Prolonged bedrest following surgery, subsequent immobilization and anesthesia all promote venous stasis. Endothelial injury, hypercoagulability and venous stasis make up Virchow's triad of the elements that lead to venous thrombosis (Whiting and Jahangir, 2016). There is significant morbidity associated with venous thromboembolism. Fatal pulmonary embolism may occur without warning, even in the absence of DVT after screening (Geerts et al., 1994). Additionally, DVT alone can lead to serious medical complications such as post-thrombotic syndrome and venous gangrene (Caprini, 2010). Over time, untreated VTE can cause respiratory distress, cerebral or myocardial ischemia, and multi-organ failure (Dahl et al., 2015). The incidence of DVT in orthopedic trauma patients has been found to be as high as 80% without prophylaxis, although the incidence can vary with location of thrombus and type of procedure (Scolaro et al., 2015). In total knee replacement, the prevalence of DVT is 41-85%, while in foot and ankle surgeries, the incidence is between 0-36% (Saragas et al., 2014). Overall, the incidence of VTE following orthopedic trauma surgery is among the highest of any field, and is greater than in general surgery patients (Caprini et al., 2001). It is therefore necessary for clinicians to be aware of the high risk of VTE in orthopedic trauma patients and to suspect VTE when additional risk factors are present. Discussion of factors that put patients at a higher risk for developing VTE is critical to reducing morbidity and mortality following orthopedic trauma. By developing a uniform set of identifiable risk factors, medical providers can accurately assess patients for risk of developing VTE and make appropriate therapeutic decisions before fatal PE or other complications occur. The most common risk factors for VTE in orthopedic trauma patients found across the literature include injury severity, obesity, history of previous VTE, immobility, and age. Several studies have shown that increased injury severity predisposes orthopedic trauma patients to VTE. Paffrath et al. specifically looked at patients with an Injury Severity Score (ISS) greater than 9 and found that the frequency of VTEs was positively correlated with increasing ISS (2010). Increased severity of injury was also found to be a risk factor for future VTE in patients with foot and ankle injuries in a clinical consensus statement written by the American College of Foot and Ankle Surgeons (ACFAS) (Fleischer et al., 2015). Additionally, Whiting et al. used a multicenter surgical database to identify risk factors for DVT following orthopedic trauma. They found that requirement of a ventilator and diagnosis of sepsis, indicating increased severity of trauma, were major risk factors for VTE (Whiting et al., 2016). However, increasing severity of trauma as a risk factor for developing VTE is not universally agreed upon. A study conducted by Geerts et al. (1994?did not find that increased ISS was correlated with DVT risk. Kim et al. (2014) evaluated Korean patients with pelvic or acetabular fractures and did not find a correlation between increased ISS and VTE development in this patient population. Differing results about injury severity and the association with VTE could have their roots in the different patient populations and outcomes of different orthopedic trauma procedures. As a result, additional studies are still necessary to determine the influence of injury severity on development of VTE in orthopedic trauma. Obesity has long been thought to predispose patients for VTE (Kakkar et al., 1970). However, it is not universally agreed upon as a risk factor in orthopedic trauma. The clinical consensus statement written by the ACFAS was specifically conflicted about obesity as a risk factor for VTE following lower extremity injuries, noting that the existing literature was not clear about its role in VTE development (Fleischer et al., 2015). Differing results about the association of obesity with VTE could be due to multiple definitions of obesity across studies (Fleischer et al., 2015). For example, Godzik et al. (2014) examined lower extremity and pelvic trauma and found that obesity was a risk factor for pulmonary embolism in these procedures, but defined obesity as BMI > 40 kg/m 2 . Sing et al. (2016) did not find an increased risk of DVT following knee surgery, but used a BMI > 30 kg/m 2 instead. Obesity might also present a different risk for VTE in different orthopedic procedures. Kim et al. (2014) did not cite obesity as a risk factor for VTE after pelvic or acetabular fractures. However, Tan et al. (2016) examined VTE risk in surgical management of overall fractures below the hip and found obesity to be a risk factor. Currently, it is believed that obesity is a risk factor for postoperative VTE in surgery for fractures distal to the knee (Ricci et al., 2015). The association between obesity and VTE development following orthopedic trauma surgeries above the knee is still not clear. One of the most important risk factors for VTE is a history of previous VTE. Tan et al. (2016) found that patients with fractures below the hip and previous history of VTE were five times more likely to have another event. Another study found that patients with orthopedic surgeries for upper limb injuries with personal or family history of VTE had increased risk of developing future VTEs (Hastie et al., 2014). In general, it is believed that personal or family history of hypercoagulability, as indicated by previous thromboembolic events, is a useful way to identify at-risk patients. Immobility after surgery has been found to be associated with higher VTE risk. Bagaria et al. (2006) conducted a prospective study on Indian patients undergoing total knee replacement, total hip replacement, or proximal femur fracture fixation and found that one significant indicator for VTE development was immobility for over 72 hours. Mantilla et al. (2003) found that patients with American Society of Anesthesiologist (ASA) scores greater than or equal to 3 had higher risk of developing PE and DVT than matched controls. However, Fleischer et al. note that immobilization alone does not warrant the use of chemical prophylaxis (2015). The age at which a patient becomes significantly at risk for VTE after surgery for orthopedic trauma is debated. For example, Zhang et al. (2015) found that patients undergoing major orthopedic surgeries over the age of 80 had a higher chance of developing VTE. Kim et al. (2014) more recently found that the risk increases after the age of 60 for patients undergoing pelvic or acetabular fractures. While other surgical modalities have established age cut-offs for increased risk of VTE, additional research is still necessary to identify specific age groups at risk for VTE after orthopedic trauma. When VTE is suspected based on clinical findings or the presence of risk factors, several different methods may be used to confirm or exclude the diagnosis of VTE. By understanding the most validated methods for VTE diagnosis, physicians can ensure that appropriate tests are ordered and resources are utilized effectively. Several different diagnostic methods for VTE exist, including diagnostic algorithms, d-dimer tests, venous ultrasonography, venography, lung scans and pulmonary angiography. The typical diagnostic pathway for VTE is presented in [Figure 1]. Figure 1: Typical pathway for the diagnosis of venous thromboembolism. Common symptoms such as calf pain, leg swelling, or redness may indicate the presence of DVT (Wells and Anderson, 2013). A classic clinical test for identification of DVT is Homan's sign, which involves unilateral leg swelling and pain with forced dorsiflexion of the foot (Vacanti et al., 2011). Pulmonary embolism, meanwhile, is typically suspected with presentation of dyspnea and pleuritic chest pain. Additionally, patients with PE may experience syncope associated with hemodynamic collapse (Keller et al., 2016). Although clinical evidence is useful for identifying patients who may require further assessment for potential VTE, signs and symptoms alone cannot be relied upon for diagnosis (Agudelo et al., 2005). For example, Homan's sign is just 50% sensitive for DVT, and the specificity of clinical findings can be even lower given the leg pain and swelling that often accompany traumatic injuries (Riddle and Wells, 2004). Additionally, up to one-half of patients with DVT will have asymptomatic presentation, making clinical diagnosis in these situations difficult (Wakefield et al., 2008). The signs and symptoms for pulmonary embolism have been similarly found to be neither sensitive nor specific (Members et al., 2008). The usefulness of clinical findings is found in prediction guidelines that incorporate signs, symptoms, and risk factors to determine pretest probability of having a VTE (Wells and Anderson, 2013). For example, the Wells score combines clinical signs and symptoms with well-established risk factors to assign patients a low (15%), moderate (29%), or high (59%) pretest probability of VTE (Stein et al., 2007). Low pretest probability scores, combined with negative results on other tests for VTE, allow the physician to rule out a diagnosis of VTE and prevent wasting resources on more expensive diagnostic tests (Ten Cate-Hoek and Prins, 2005). The efficacy of these tests for excluding diagnosis of VTE has been validated by numerous studies. A systematic review examining 14 studies found less than a 5% prevalence of DVT in patients with a low score on the Wells model and determined that DVT diagnosis can be safely excluded in these patients when a D-dimer test is also negative (Wells et al., 2006). Other studies have found shown that the Wells score is effective for guiding diagnostic decisions for PE (Klok et al., 2008; Lucassen et al., 2011; Penaloza et al., 2011). Therefore, the Wells score should be used as a preliminary test in patients with suspected VTE to identify patients who require additional VTE diagnostic measures. D-dimer is a degradation product of cross-linked fibrin (Geersing et al., 2009). Circulating levels of D-dimer are typically elevated when either DVT or PE is present, and may be assayed to aid in the diagnosis of VTE following orthopedic trauma surgery (Naeem et al., 2009; Wells et al., 2003). However, D-Dimer levels may also be elevated following trauma, major surgery, pregnancy, cancer or hemorrhage (Jiang et al., 2015). Thus, a D-dimer test has a low specificity for VTE of around 40%, although the sensitivity of the test is much higher (90%). As a result of these properties, D-dimer tests are most useful for excluding a differential of VTE. Typically, use of D-dimer in diagnosis of VTE is performed after calculation of a pre-test probability by a clinical algorithm. A low pretest probability of VTE followed by a negative D-dimer has been found to reliably exclude the potential for VTE (Crawford et al., 2016). Today, the use of point-of-care D-dimer tests produce results within 10-15 minutes, allowing for rapid decision-making regarding VTE prophylaxis and the ordering of diagnostic tests (Geersing et al., 2009). D-dimer tests are therefore most effectively used in conjunction with the Wells score or other diagnostic tests to reliably exclude the diagnosis of VTE following negative results. Venous ultrasonography is the most widely used diagnostic modality for the diagnosis of DVT. There are three main types of ultrasonography devices: compression ultrasound, doppler ultrasound and duplex ultrasound (Zierler, 2004). In compression ultrasonography, a diagnosis of DVT is made when the ultrasound transducer is unable to completely collapse the vein of interest due to the presence of a thrombus (Katz et al., 2014). Doppler ultrasonography involves using reflected sound waves to detect changes in blood flow, such as occlusion caused by a VTE. Duplex ultrasonography combines both compression and doppler ultrasounds into a single device. Currently, duplex ultrasound is considered to be the primary noninvasive diagnostic method for DVT (Zierler, 2004). Ultrasonography is quick, non-invasive and relatively inexpensive. Additionally, the test's high sensitivity (100%) and specificity (98%) for proximal DVT make a positive result diagnostic for proximal DVT, while negative results allow for exclusion of the condition (de Oliveira et al., 2008). The use of venous ultrasound for diagnosing VTE during orthopedic trauma has been validated by the literature (Knudson et al., 1992; Roger, 2001; Agudelo et al., 2005). However, the Orthopaedic Trauma Association recommends against the use of duplex ultrasonography to screen asymptomatic orthopedic trauma patients for VTE (Sagi et al., 2015). Use of duplex ultrasonography is therefore recommended when the clinician suspects VTE following the use of a diagnostic algorithm and d-dimer test. Contrast venography allows for visualization of the patient's entire venous system. While contrast venography was regularly employed for the diagnosis of VTE in the past, it is an invasive test and runs the possibility of producing contrast-induced allergies and even DVT (Bettmann et al., 1987; Rogers et al., 2002). Additionally, in many trauma patients with significant injuries or kidney damage, venography may be contraindicated (Agudelo et al., 2005). Thus, contrast venography is now less commonly used than newer methods of venography, such as magnetic resonance venography (MRV). MRV can be performed without intravenous contrast using time of flight and phase-contrast techniques (Kanne and Lalani, 2004). It is a reliable method for detection of VTE, with both high sensitivity (100%) and specificity (95%) (Carpenter et al., 1993; Dupas et al., 1995; Evans et al., 1996). MRV has several advantages over ultrasonography. For example, it is better at delineating the inferior cava and pelvic veins, and does not require venous compression, allowing examination of limbs in plaster casts, obese patients and other impediments to sonography (Kanne and Lalani, 2004). Thus, MRV may be the preferred method of VTE diagnosis instead of ultrasonography under these conditions. A ventilation/perfusion lung scan (VQ scan) measures air and blood blow into the lungs and can be used to help diagnose or rule out PE. The use of VQ scans in the diagnosis of PE is well validated in the literature (PIOPED Investigators, 1990; Goldhaber, 2004; Anderson DR et al., 2007). Additionally, the test is non-invasive and inexpensive. As a result, VQ scans have been classically used for diagnosis of PE in orthopedic trauma patients (Haentjens, 1996). However, VQ scans have drawbacks that limit their use. First, results are based on the indirect visualization of an embolus, and are thus limited to "high, intermediate, or low probability." The test is also time-consuming, taking approximately 1 hour to complete (Kim et al., 2010). Finally, patients determined to be at low or intermediate risk of PE following VQ scans still have PE at rates of up to 40%, complicating the decision to treat patients following these results (Doğan et al., 2015). Today, helical computer tomography pulmonary angiography (CTPA) is also used to diagnose PE. CTPA provides direct visualization of the pulmonary arterial system, and three-dimensional reconstructions can also be generated from raw data to enhance diagnostic accuracy (Kanne and Lalani, 2004). Because CTPA has both a high sensitivity and specificity for PE, it is the first-line diagnostic method. The 3-month mortality after a normal CTPA has been shown to be very low (< 1%), making it safe to withhold anticoagulant therapy in case of negative CTPA results (Mos et al., 2009; Galipienzo et al., 2010). CTPA does have important limitations. Examination is expensive and requires the use of IV contrast that may lead to kidney damage (Scolaro et al., 2015). Additionally, CTPA has the ability to identify clots at a high rate, but cannot predict their clinical significance. As a result, there is a risk of over-diagnosis of PE as these tests become increasingly prevalent (Wiener et al., 2013). This over-diagnosis is dangerous, potentially leading to anticoagulation in patients with subclinical PE and putting them at unnecessary risk. As a result, physicians should only use CTPA for patients with intermediate to high risks of PE based on clinical algorithms (Wiener et al., 2013). The use VTE prophylaxis has been shown to reduce morbidity and mortality in trauma patients. As a result, the American College of Chest Physicians (ACCP) recommends the use of antithrombotic prophylaxis in all patients undergoing major orthopedic surgery without major contraindications (Falck-Ytter et al., 2012). Methods of antithrombotic prophylaxis include chemical anticoagulants, mechanical approaches and IVC filters, and all have been shown to decrease rates of VTE following orthopedic trauma patients. The same methods of VTE prophylaxis are also used for VTE treatment if a diagnosis is made. Chemical approaches to antithrombotic prophylaxis involve interruption of the coagulation cascade. Since these therapies impede normal physiological coagulation, they also significantly increase the risk of hemorrhage (Crowther and Warkentin, 2008). As a result, careful assessment must be made by clinicians when deciding on when and which type of anticoagulant should be used. In general, low molecular weight heparins are currently the preferred agent for VTE prophylaxis in orthopedic surgery (Falck-Ytter et al., 2012). LMWHs are produced through depolymerization of low dose unfractionated heparin (LDUH), and include enoxaparin, dalteparin and tinzaparin. LMWHs inactivate numerous coagulation enzymes by binding to antithrombin and have low affinity for proteins other than antithrombin. There are thus associated with more predictable pharmacokinetics and few side effects than LDUH (Merli and Groce, 2010; Chana-Rodrνguez et al., 2015). As a result, LMWH is currently the preferred method of prophylaxis in major orthopedic surgery according to the ACCP (Falck-Ytter et al., 2012). The efficacy of LMWH in reducing VTE in orthopedic trauma patients has been validated by numerous studies. One randomized controlled trial performed by Knudson et al. found a significantly lower rate of DVT in trauma patients treated with LMWH prophylaxis versus no chemical prophylaxis (Knudson et al., 1996). Additionally, there is evidence that the early use of LMWH is the only intervention that results in a decrease of DVT and PE in pelvic trauma patients (Steele et al., 2005). Because of the efficacy of LMWH in many different orthopedic procedures and low risk of complications, it is a safe choice for prophylaxis in the setting of orthopedic trauma. Aspirin blocks platelet aggregation by acting as an irreversible inhibitor of cyclo-oxygenase 1. It is inexpensive, administered orally and widely available. According to the ACCP, low-dose aspirin given before major orthopedic surgery and continued for 35 days results in seven fewer VTEs per 1,000 (Falck-Ytter et al., 2012). However, aspirin offers reduced protection against VTE compared with other thromboprophylactic techniques (Chana-Rodrνguez et al., 2015). In fact, trials comparing aspirin to LMWH have found more symptomatic DVTs in patients receiving aspirin (DeDea, 2012). Despite of its limited efficacy, the ACCP considers aspirin combined with mechanical prophylaxis an acceptable choice for VTE prophylaxis in patients undergoing major orthopedic surgery, including orthopedic trauma surgery (Falck-Ytter et al., 2012). Warfarin, a member of the coumadin class of anticoagulant drugs, acts as a vitamin K antagonist and inhibits the synthesis of clotting factors II, VII, IX, and X (Peetz et al., 2000). Unlike heparins, warfarin is orally administered. Additionally, warfarin has variable metabolism in different individuals, and requires monitoring of patient international normalized ratio (INR) to prevent major bleeding complications. Because the pharmacodynamic response to warfarin is delayed by oral administration and difficult to predict based on differences in drug metabolism, it is challenging to use as antithrombotic prophylaxis and is better used as treatment for existing VTE (Kuruvilla and Gurk-Turner, 2001). Thus, Warfarin is not recommended over LMWH for prophylaxis after orthopedic trauma surgery (Falck-Ytter et al., 2012). Fondaparinux is a synthetic pentasaccharide that selectively inhibits Factor Xa (Toker et al., 2011). It is 100% bioavailable when administered subcutaneously and exhibits a linear pharmacokinetic profile with little variability between subjects (Turpie et al., 2002). Additionally, it has a once-daily dosing regimen that helps with improving compliance and reducing cost. Unlike heparins, it does not cause thrombocytopenia in patients and has even been recommended for use in treating heparin-induced-thrombocytopenia (Honore et al., 2016). There is some evidence in the literature supporting the use of fondaparinux in orthopedic trauma. For example, a study conducted by Lu et al. (2009) found that fondaparinux offered protection against VTE in high-risk trauma patients. Other studies reported that fondaparinux was more effective in reducing the risk of VTE than LMWH for pelvic and acetabular fractures and was not associated with adverse bleeding (Tsiridis et al., 2012, 2011). Despite the evidence supporting its use in orthopedic trauma surgery, the ACCP nonetheless recommends the use of LMWH over fondaparinux when possible (Falck-Ytter et al., 2012). New Oral Anticoagulants (NOAC) include apixaban, rivaroxaban, edoxaban and dabigatran. NOACs inhibit factors II and Xa like heparins, but unlike heparins, bind the compounds directly instead of indirectly through antithrombin. As a result, these agents can be more effective in prevention of thrombus formation (Rachidi et al., 2013). Although all four agents have been tested as VTE prophylaxis in orthopedic patients, only apixaban and rivaroxaban are approved by the FDA for orthopedic surgery (Bass, 2015). One systematic review found slightly improved DVT prevention in NOACs versus LMWH for total joint arthroplasty, but also reported increased rates of major bleeding complications (Adam et al., 2013). Additionally, a retrospective cohort study comparing rivaroxaban with LMWH reported a significantly decreased rate of symptomatic VTE in the rivaroxaban group for patients with traumatic lower limb fractures (Long et al., 2014). Although early results of the efficacy of these drugs are promising, additional studies are needed to determine their role in orthopedic trauma. Methods of mechanical prophylaxis include sequential compression devices, graduated compression stockings and venous foot pumps. Mechanical prophylaxis works by reducing venous diameter, resulting in an increase in venous flow velocity and reduction of stasis. The most recent Cochrane database systematic review found that pharmacologic prophylaxis was more effective than mechanical approaches at reducing VTE risk (Barrera et al., 2013). Mechanical prophylactic methods are thus better utilized in conjunction with chemical prophylactic strategies. In fact, the ACCP currently the recommends dual use of mechanical prophylaxis and chemical prophylaxis for patients undergoing major orthopedic surgery (Falck-Ytter et al., 2012). Mechanical prophylaxis may be used instead of chemical prophylaxis in orthopedic trauma surgery when patients have contraindications for chemical anticoagulants, including intracranial hemorrhage, spinal injury, or anemia (Chana-Rodrνguez et al., 2015). In high-risk patients with contraindications to mechanical and chemical anticoagulation, prophylactic inferior vena cava filters (IVCF) can be used to prevent PE. Evidence from the literature has shown a significant reduction in PE rates with IVCFs. For example, a recent systematic review and meta-analysis by Haut et al. demonstrated a consistent reduction in overall fatal PE with IVCF placement (2014). Another study by Toro et al. (2008) found that IVCFs were both safe and effective in preventing PE. However, the placement of IVCF involves an invasive procedure, and thrombi may form at the site of the IVCF. As a result, they are typically only used as a last resort for prevention of PE in patients who have had a PE despite of anticoagulation, or in patients with intracranial hemorrhage or other contraindications to anticoagulants (Scolaro et al., 2015). Adam SS, McDuffie JR, Lachiewicz PF Ortel TL, Williams JW (2013) Comparative effectiveness of new oral anticoagulants and standard thromboprophylaxis in patients having total hip or knee replacement: a systematic review. Ann Intern Med 159:275-284. Agudelo JF, Morgan SJ, Smith WR (2005) Venous thromboembolism in orthopedic trauma patients. Orthopedics 28:1164-1171. Anderson DR, Kahn SR, Rodger MA, Kovacs MJ, Morris T, Hirsch A, Lang E, Stiell I, Kovacs G, Dreyer J, Dennie C, Cartier Y, Barnes D, Burton E, Pleasance S, Skedgel C, O′Rouke K, Wells PS (2007) Computed tomographic pulmonary angiography vs ventilation-perfusion lung scanning in patients with suspected pulmonary embolism: A randomized controlled trial. JAMA 298:2743-2753. Bagaria V, Modi N, Panghate A, Vaidya S (2006) Incidence and risk factors for development of venous thromboembolism in Indian patients undergoing major orthopaedic surgery: results of a prospective study. Postgrad Med J 82:136-139. Barrera LM, Perel P, Ker K, Cirocchi R, Farinella E, Morales Uribe CH (2013) Thromboprophylaxis for trauma patients. Cochrane Database Syst Rev CD008303. Bass AR (2015) Using New Oral Anticoagulants in Patients Undergoing Major Orthopedic Surgery. Curr Rheumatol Rep 17:25. Bettmann MA, Robbins A, Braun SD, Wetzner S, Dunnick NR, Finkelstein J (1987) Contrast venography of the leg: diagnostic efficacy, tolerance, and complication rates with ionic and nonionic contrast media. Radiology 165:113-116. Caprini JA (2010) Risk assessment as a guide for the prevention of the many faces of venous thromboembolism. Am J Surg, Venous Thromboembolism in Surgery-A Preventable Complication 199: S3-S10. Caprini JA, Arcelus JI, Reyna JJ (2001) Effective risk stratification of surgical and nonsurgical patients for venous thromboembolic disease. Semin Hematol 38:12-19. Carpenter JP, Holland GA, Baum RA, Owen RS, Carpenter JT, Cope, C (1993) Magnetic resonance venography for the detection of deep venous thrombosis: comparison with contrast venography and duplex Doppler ultrasonography. J Vasc Surg 18:734-741. Chana-Rodríguez F, Mañanes RP, Rojo-Manaute J, Haro JA, Vaquero-Martín J (2015) Methods and guidelines for venous thromboembolism prevention in polytrauma patients with pelvic and acetabular fractures. Open Orthop J 9:313-320. Crawford F, Andras A, Welch K, Sheares K, Keeling D, Chappell FM (2016) D-dimer test for excluding the diagnosis of pulmonary embolism. Cochrane Database Syst Rev 8:CD010864. Crowther MA, Warkentin TE (2008) Bleeding risk and the management of bleeding complications in patients undergoing anticoagulant therapy: focus on new anticoagulant agents. Blood 111:4871-4879. Dahl OE, Harenberg J, Wexels F, Preissner KT (2015) Arterial and venous thrombosis following trauma and major orthopedic surgery: molecular mechanisms and strategies for intervention. Semin Thromb Hemost 41:141-145. DeDea L (2012) DVT prophylaxis with aspirin in orthopedic surgery patients. J Am Acad Physician Assist 25: 21.
de Oliveira A, França GJ, Vidal EA, Stalke PS, Baroncini LA (2008) Duplex scan in patients with clinical suspicion of deep venous thrombosis. Cardiovasc Ultrasound 6:53. Dobesh PP (2009) Economic burden of venous thromboembolism in hospitalized patients. Pharmacotherapy 29:943-953. Dupas B, El Kouri D, de Faucal P, Planchon B, Peltier P, Lejeune JJ (1995) Angiomagnetic resonance imaging of iliofemorocaval venous thrombosis. The Lancet 346:17-19. Evans AJ, Sostman HD, Witty LA, Paulson EK, Spritzer CE, Hertzberg BS, Carroll BA, Tapson VF, Saltzman HA, DeLong DM (1996) Detection of deep venous thrombosis: prospective comparison of MR imaging and sonography. J Magn Reson Imaging JMRI 6:44-51. Falck-Ytter Y, Francis CW, Johanson NA, Curley C, Dahl OE, Schulman S, Ortel TL, Pauker SG, Colwell CW (2012) Prevention of VTE in orthopedic surgery patients. Chest 141: e278S-e325S. Fleischer AE, Abicht BP, Baker JR, Boffeli TJ, Jupiter DC, Schade VL (2015) American College of Foot and Ankle Surgeons′ clinical consensus statement: risk, prevention, and diagnosis of venous thromboembolism disease in foot and ankle surgery and injuries requiring immobilization. J Foot Ankle Surg Off Publ Am Coll Foot Ankle Surg 54:497-507. Galipienzo J, García de Tena J, Flores J, Alvarez C, Alonso-Viteri S, Ruiz A (2010) Safety of withholding anticoagulant therapy in patients with suspected pulmonary embolism with a negative multislice computed tomography pulmonary angiography. Eur J Intern Med 21:283-288. Geersing GJ, Janssen KJ, Oudega R, Bax L, Hoes AW, Reitsma JB, Moons KG (2009) Excluding venous thromboembolism using point of care D-dimer tests in outpatients: a diagnostic meta-analysis. BMJ 339: b2990. Geerts WH, Code KI, Jay RM, Chen E, Szalai JP (1994) A prospective study of venous thromboembolism after major trauma. N Engl J Med 331:1601-1606. Godzik J, McAndrew CM, Morshed S, Kandemir U, Kelly MP (2014) Multiple lower-extremity and pelvic fractures increase pulmonary embolus risk. Orthopedics 37:e517-524. Goldhaber SZ (2004) Pulmonary embolism. Lancet Lond Engl 363:1295-1305. Haentjens P (1996) Thromboembolic prophylaxis in orthopaedic trauma patients: a comparison between a fixed dose and an individually adjusted dose of a low molecular weight heparin (nadroparin calcium). Injury 27:385-390. Hastie GR, Pederson A, Redfern D (2014) Venous thromboembolism incidence in upper limb orthopedic surgery: do these procedures increase venous thromboembolism risk? J Shoulder Elb Surg Am Shoulder Elb Surg Al 23:1481-1484. Haut ER, Garcia LJ, Shihab HM, Brotman DJ, Stevens KA, Sharma R, Chelladurai Y, Akande TO, Shermock KM, Kebede S, Segal JB, Singh S (2014) The effectiveness of prophylactic inferior vena cava filters in trauma patients: a systematic review and meta-analysis. JAMA Surg 149:194-202. Jiang Y, Li J, Liu Y, Li YC, Zhang WG (2015) Risk factors for deep vein thrombosis after orthopedic surgery and the diagnostic value of D-Dimer. Ann Vasc Surg 29:675-681. Kakkar VV, Howe CT, Nicolaides AN, Renney JTG, Clarke MB (1970) Deep vein thrombosis of the leg. Am J Surg 120:527-530. Kanne JP, Lalani TA (2004) Role of computed tomography and magnetic resonance imaging for deep venous thrombosis and pulmonary embolism. Circulation 109: I15-I21. Keller K, Beule J, Balzer JO, Dippold W (2016) Syncope and collapse in acute pulmonary embolism. Am J Emerg Med 34:1251-1257. Kim HJ, Walcott-Sapp S, Leggett K, Bass A, Adler RS, Pavlov H, Westrich GH (2010) Detection of Pulmonary Embolism in the Postoperative Orthopedic Patient Using Spiral CT Scans. HSS J 6:95-98. Kim JW, Oh CW, Oh JK, Baek SG, Lee BJ, Hong HP, Min WK (2014) The incidence and the risk factors of venous thromboembolism in Korean patients with pelvic or acetabular fractures. J Orthop Sci Off J Jpn Orthop Assoc 19:471-477. Klok FA, Kruisman E, Spaan J, Nijkeuter M, Righini M, Aujesky D, Roy PM, Perrier A, Le Gal G, Huisman MV (2008) Comparison of the revised Geneva score with the Wells rule for assessing clinical probability of pulmonary embolism. J Thromb Haemost 6:40-44. Knudson MM, Collins JA, Goodman SB, McCrory DW (1992) Thromboembolism following multiple trauma. J Trauma 32:2-11. Knudson MM, Morabito D, Paiement GD, Shackleford S (1996) Use of low molecular weight heparin in preventing thromboembolism in trauma patients. J Trauma 41:446-459. Kuruvilla M, Gurk-Turner C (2001) A review of warfarin dosing and monitoring. Proc Bayl Univ Med Cent 14:305-306. Long A, Zhang, L, Zhang Y, Jiang B, Mao Z, Li H, Zhang S, Xie Z, Tang P (2014) Efficacy and safety of rivaroxaban versus low-molecular-weight heparin therapy in patients with lower limb fractures. J Thromb Thrombolysis 38:299-305. Lu JP, Knudson MM, Bir N, Kallet R, Atkinson K (2009) Fondaparinux for prevention of venous thromboembolism in high-risk trauma patients: a pilot study. J Am Coll Surg 209:589-594. Lucassen W, Geersing GJ, Erkens PM, Reitsma JB, Moons KG, Büller H, van Weert HC (2011) Clinical decision rules for excluding pulmonary embolism: a meta-analysis. Ann Intern Med 155:448-460. Mantilla CB, Horlocker TT, Schroeder DR, Berry DJ, Brown DL (2003) Risk factors for clinically relevant pulmonary embolism and deep venous thrombosis in patients undergoing primary hip or knee arthroplasty. Anesthesiology 99:552-560; discussion 5A. Merli GJ, Groce JB (2010) Pharmacological and clinical differences between low-molecular-weight heparins. Pharm Ther 35:95-105. Mos IC, Klok FA, Kroft LJ, DE Roos A, Dekkers OM, Huisman MV (2009) Safety of ruling out acute pulmonary embolism by normal computed tomography pulmonary angiography in patients with an indication for computed tomography: systematic review and meta-analysis. J Thromb Haemost 7:1491-1498. Naeem MA, Usman M, Latif MK, Aamir M (2009) The relationship of D-dimer levels with risk for developing deep-vein thrombosis and/or pulmonary thromboembolism after orthopaedic trauma surgery. J Ayub Med Coll Abbottabad JAMC 21:113-116. Nayak L, Vedantham S (2012) Multifaceted management of the postthrombotic syndrome. Semin Interv Radiol 29:16-22. Paffrath T, Wafaisade A, Lefering R, Simanski C, Bouillon B, Spanholtz T, Wutzler S, Maegele M, Trauma Registry of DGU (2010) Venous thromboembolism after severe trauma: incidence, risk factors and outcome. Injury 41:97-101. Peetz D, Hafner G, Hansen M, Mayer A, Rippin G, Rommens PM, Prellwitz W (2000) Dose-adjusted thrombosis prophylaxis in trauma surgery according to levels of D-dimer. Thromb Res 98:473-483. 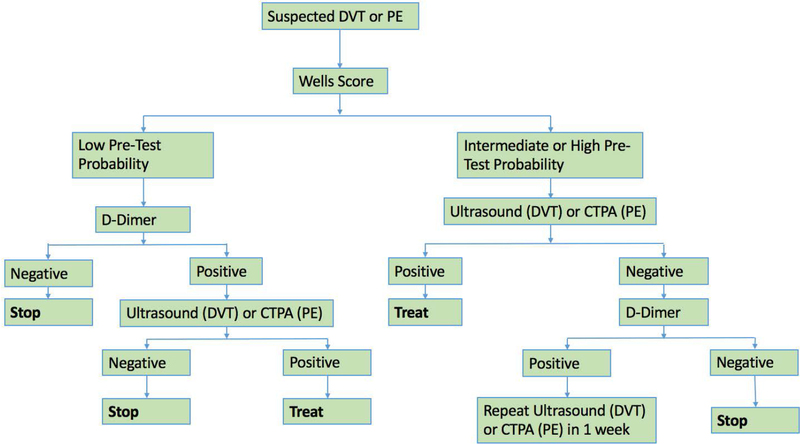 Penaloza A, Melot C, Motte S (2011) Comparison of the Wells score with the simplified revised Geneva score for assessing pretest probability of pulmonary embolism. Thromb Res 127:81-84. PIOPED Investigators (1990) Value of the ventilation/perfusion scan in acute pulmonary embolism. Results of the prospective investigation of pulmonary embolism diagnosis (PIOPED). JAMA 263:2753-2759. Rachidi S, Aldin ES, Greenberg C, Sachs B, Streiff M, Zeidan AM (2013) The use of novel oral anticoagulants for thromboprophylaxis after elective major orthopedic surgery. Expert Rev Hematol 6:677-695. Raskob GE, Silverstein R, Bratzler DW, Heit JA, White RH (2010) Surveillance for deep vein thrombosis and pulmonary embolism: recommendations from a national workshop. Am J Prev Med 38:S502-509. Ricci WM, Black JC, McAndrew CM, Gardner MJ (2015) What′s New in Orthopaedic Trauma. J Bone Jt Surg Am 97:1200-1207. Riddle DL, Wells PS (2004) Diagnosis of lower-extremity deep vein thrombosis in outpatients. Phys Ther 84:729-735. Roger FB (2001) Venous thromboembolism in trauma patients: a review. Surgery 130:1-12. Rogers FB, Cipolle MD, Velmahos G, Rozycki G, Luchette FA (2002) Practice management guidelines for the prevention of venous thromboembolism in trauma patients: the EAST practice management guidelines work group. J Trauma 53:142-164. Sagi HC, Ahn J, Ciesla D, Collinge C, Molina C, Obremskey WT, Guillamondegui, O, Tornetta, P, Orthopaedic Trauma Association Evidence Based Quality Value and Safety Committee (2015) Venous thromboembolism prophylaxis in orthopaedic trauma patients: a survey of ota member practice patterns and ota expert panel recommendations. J Orthop Trauma 29:e355-362. Saragas NP, Ferrao PNF, Saragas E, Jacobson BF (2014) The impact of risk assessment on the implementation of venous thromboembolism prophylaxis in foot and ankle surgery. Foot Ankle Surg Off J Eur Soc Foot Ankle Surg 20:85-89. Scolaro JA, Taylor RM, Wigner NA (2015) Venous thromboembolism in orthopaedic trauma. J Am Acad Orthop Surg 23:1-6. Sing DC, Luan TF, Feeley BT, Zhang AL (2016) Is obesity a risk factor for adverse events after knee arthroscopy? Arthrosc J Arthrosc Relat Surg Off Publ Arthrosc Assoc N Am Int Arthrosc Assoc 32:1346-1353.e1. Steele N, Dodenhoff RM, Ward AJ, Morse MH (2005)Thromboprophylaxis in pelvic and acetabular trauma surgery. The role of early treatment with low-molecular-weight heparin. J Bone Joint Surg Br 87:209-212. Stein PD, Woodard PK, Weg JG, Wakefield TW, Tapson VF, Sostman HD, Sos TA, Quinn DA, Leeper KV, Hull RD, Hales CA, Gottschalk A, Goodman LR, Fowler SE, Buckley JD (2007) Diagnostic pathways in acute pulmonary embolism: recommendations of the PIOPED II Investigators. Radiology 242:15-21. Tan L, Qi B, Yu T, Wang C (2016) Incidence and risk factors for venous thromboembolism following surgical treatment of fractures below the hip: a meta-analysis. Int Wound J doi: 10.1111/iwj.12533. Ten Cate-Hoek AJ, Prins MH (2005) Management studies using a combination of D-dimer test result and clinical probability to rule out venous thromboembolism: a systematic review. J Thromb Haemost 3:2465-2470. Toker S, Hak DJ, Morgan SJ, Toker S, Hak DJ, Morgan SJ (2011) Deep vein thrombosis prophylaxis in trauma patients, deep vein thrombosis prophylaxis in trauma patients. Thromb Thromb 2011:e505373. Torbicki A, Perrier A, Konstantinides S, Agnelli G, Galiè N, Pruszczyk P, Bengel F, Brady AJ, Ferreira D, Janssens U, Klepetko W, Mayer E, Remy-Jardin M, Bassand JP; ESC Committee for Practice Guidelines (CPG) (2008) Guidelines on the diagnosis and management of acute pulmonary embolism: the Task Force for the Diagnosis and Management of Acute Pulmonary Embolism of the European Society of Cardiology (ESC). Eur Heart J 29:2276-2315. Toro JB, Gardner MJ, Hierholzer C, Sama D, Kosi C, Ertl W, Helfet DL (2008) Long-term consequences of pelvic trauma patients with thromboembolic disease treated with inferior vena caval filters. J Trauma 65:25-29. Tsiridis E, Gamie Z, George MJ, Hamilton-Baille D, West RM, Giannoudis PV (2011) Early postoperative bleeding in polytrauma patients treated with fondaparinux: literature review and institutional experience. Curr Vasc Pharmacol 9:42-47. Tsiridis E, Gamie Z, Upadhyay N, George M, Hamilton-Baillie D, Giannoudis PV (2012) Fondaparinux compared with enoxaparin for the prevention of deep vein thrombosis in patients with pelvic or acetabular fractures: a prospective randomised study. Orthop Proc 94-B:76-76. Turpie AG, Bauer KA, Eriksson BI, Lassen MR, for the Steering Committees of the Pentasaccharide Orthopedic Prophylaxis Studies (2002) Fondaparinux vs enoxaparin for the prevention of venous thromboembolism in major orthopedic surgery: a meta-analysis of 4 randomized double-blind studies. Arch Intern Med 162:1833-1840. Vacanti C, Segal S, Sikka P, Urman R (2011) Essential Clinical Anesthesia. Cambridge University Press. Wakefield TW, Caprini J, Comerota AJ (2008) Thromboembolic diseases. Curr Probl Surg 45:844-899. Wells PS, Anderson D (2013) The diagnosis and treatment of venous thromboembolism. ASH Educ Program Book 2013:457-463. Wells PS, Owen C, Doucette S, Fergusson D, Tran H (2006) Does this patient have deep vein thrombosis? JAMA 295:199-207. Wells PS, Anderson DR, Rodger M, Forgie M, Kearon C, Dreyer J, Kovacs G, Mitchell M, Lewandowski B, Kovacs MJ (2003) Evaluation of D-dimer in the diagnosis of suspected deep-vein thrombosis. N Engl J Med 349:1227-1235. Whiting PS, Jahangir AA (2016) Thromboembolic disease after orthopedic trauma. Orthop Clin North Am 47:335-344. Whiting PS, White-Dzuro GA, Greenberg SE, VanHouten JP, Avilucea FR, Obremskey WT, Sethi MK (2016) Risk factors for deep venous thrombosis following orthopaedic trauma surgery: an analysis of 56,000 patients. Arch Trauma Res 5:e32915. Wiener RS, Schwartz LM, Woloshin S (2013) When a test is too good: how CT pulmonary angiograms find pulmonary emboli that do not need to be found. BMJ 347:f3368. Zhang J, Chen Z, Zheng J, Breusch SJ, Tian J (2015) Risk factors for venous thromboembolism after total hip and total knee arthroplasty: a meta-analysis. Arch Orthop Trauma Surg 135:759-772. Zierler BK (2004) Ultrasonography and diagnosis of venous thromboembolism. Circulation 109:I-9-I-14. All authors contributed to the concept of the manuscript as well as the literature search. IB and EGP contributed to manuscript preparation, and all authors worked on manuscript editing, review and approval. All authors took responsibility for the integrity of the work as a whole from inception to the published article.